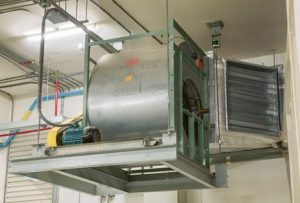 Installing an industrial fan inside of your commercial workspace is a great way to improve the air quality in your facility and protect your employees from dust, allergens, and other contaminants that can pollute the air. However, there are several different types of industrial fans that you can install, so you should pick the one that will work best for your specific situation. Two of the most popular fans are centrifugal and axial fans, and while they are similar in that they both help move large amounts of air, there are quite a few differences in the way that they operate. Centrifugal fans rely on rotating paddle impellers that are designed to move air and gasses out of facilities. They can accommodate high pressure and low flow rates, and they are especially useful in facilities that have debris in the air. Thanks to the way the blades move inside of centrifugal fans, you won’t have to worry about the debris creating clogs in them. But one drawback for some people is that they don’t usually move as much air as axial fans do. Axial fans are designed to accommodate low pressure and high flow rates. They are ideal for facilities that are looking for an industrial fan that can move a large amount of air from one area into another space. There are a variety of blades used in axial fans, including paddle blades, variable pitch blades, and aerofoil blades, and those blades rotate around an axis. This is why they are able to handle so much air at once, unlike centrifugal fans. Which option is best for you? When you’re picking out a new industrial fan, it can be difficult to answer that question, and you don’t want to choose the wrong type of fan and end up installing one that doesn’t meet your needs. Dynamic Fan can step in and show you the fans that would be the best options for you and provide installation and maintenance as well. Call us at 973-244-2422 today to discover why companies have trusted us with their industrial fan needs for almost 30 years now.